Cool weather helped fire crews gain ground Thursday against the nation's deadliest wildfire in a century, as the search went on for more bodies. At least 63 people were killed and 631 were unaccounted for a week after the flames swept through. The nearly 220-square-mile blaze in Northern California was 40 percent contained, the state fire agency said, and firefighters succeeded in slowing the flames' advance toward populated areas. 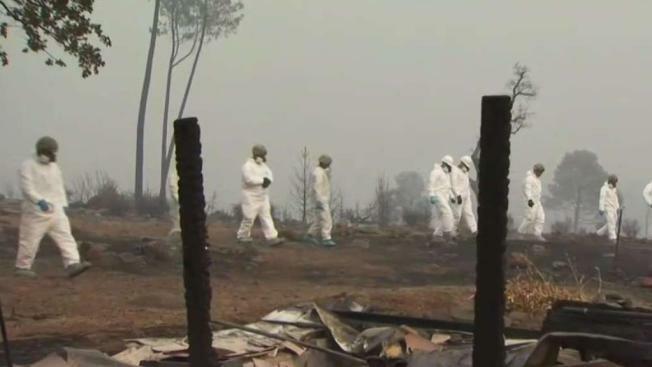 More than 450 searchers were assigned to look for remains in Paradise, which was all but destroyed Nov. 8, and in outlying areas such as Magalia, a forested town of about 11,000. Many of the missing were elderly and from Magalia. At the other end of the state, crews continued to battle wildfires in Southern California, including a blaze of more than 153 square miles that destroyed over 500 structures in Malibu and nearby communities. At least three deaths were reported. "Now is not the time to point fingers," Zinke said. "There are lots of reasons these catastrophic fires are happening." He cited higher temperatures, dead trees and the poor forest management. While most of Paradise was wiped out, in Magalia there was a sharp dividing line between homes that burned and those that were spared. Tom Driver, the office manager and elder at Magalia Community Church, said he heard the church made it through the blaze, though he did not know whether his home did. "I've been able to account for all of the congregation," said Driver, who is staying with family in Oakland. "They're all over the place, but they got out in pretty good time." Kim Bonini, one of those who got out safely, left after hearing someone on a bullhorn two blocks over urging people to leave. The power in her home had gone out that morning, leaving her with only her car radio. "My cell didn't work, my house phone didn't work, nothing. Nothing except for me crawling into my car," Bonini said from her daughter's home in Chico. "If I wouldn't have heard them two blocks down, I wouldn't have known I had to evacuate."